A project to build an open-pit iron ore mine in Centro Chato – a village of 3,144 inhabitants according to the 2000 census [es] – in central Uruguay has divided Uruguayans. While some see it as an opportunity for employment and economic growth, others are concerned about the environmental consequences and question whether the country will actually benefit from the mine’s profits. The Aratiri project, owned by Zamin Ferrous, a London-based minerals company, will cost an estimated $2.5 billion (1.7 million Euros), the largest mining project ever in South America, and equivalent to more than six percent of Uruguay's gross domestic product. For the past two years, the company has been permitted to prospect for iron on 120,000 hectares (460 square miles) of land around the village of Cerro Chato in the center-east of the country. In Uruguay the sub-soil belongs to the state, and it has asked farmers to let the company use their land to hunt for iron ore.
For relatively meager compensation, Claudia Perugorria allowed the mining company's digging machines onto her 47 hectares (116 acres), where she raises about 30 cows and sheep. Today, her pastures are scarred with traces of tires, craters and holes where animals may stumble and injure themselves. Como uruguayos preocupados en el desarrollo verdadero, la salud ambiental y humana y el derecho de la población a opinar y participar de los procesos de decisión que afectarán directamente sus vidas y medio de supervivencia, nos preguntamos: ¿cómo se conjuga el Uruguay Natural al que apuesta el gobierno con un emprendimiento minero de tal envergadura?, ¿cuán grande será el beneficio en términos económicos para nuestro país si se tienen en cuenta el daño social y ambiental irreversibles?, ¿qué pasará con esas tierras una vez que la empresa se retire?, ¿esto está incluido en los cálculos? As Uruguayans concerned about real development, environmental and human health and the right of people to express their opinions and participate in the decision processes that will directly affect their lives and means of survival, we wonder: How does the ‘Natural Uruguay’ the government is pushing coincide with a mining project of this magnitude How big is the benefit in economic terms for our country if we take into account the irreversible environmental and social damage? What will happen to the land once the company withdraws? Is this included in the calculations? live and work in some of the 120,000 acres requested by the company for exploration and, therefore, face difficulties in planning their future farming activities. The day before, on Saturday June 25, the company's employees and other supporters of Aratirí marched along the same streets defending the project. 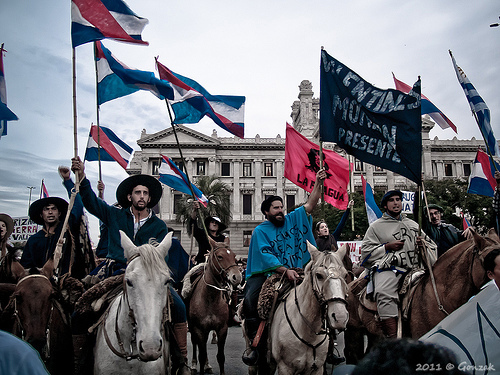 The blog Aire Libre [es] shares audio and photos of the two protests. 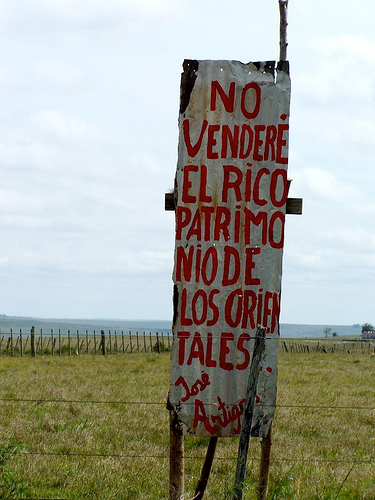 "I will not sell the rich patrimony of the 'orientales'", José Artigas. Image by Flickr user Frente Aratiri (CC BY-SA 2.0). Quien controla el hierro controla el Uruguay..Al manejar 3.000 millns de dls anuales Aratiri será un estado dentro del estado. Whoever controls iron ore controls Uruguay..By managning 3,000 million dollars annually Aratiri will be a state within a state. EL DEBATE DE ARATIRI ES ESTERIL. HAY QUE PROHIBIR LA MINERIA A CIELO ABIERTO. HAY QUE CUIDAR EL 1/2 AMBIENTE. EL CAPITAL ESTA EN LA CABEZA. The Aratiri debate is sterile. Open pit mining must be banned. The environment must be protected. Capital is only in our heads. Uruguayan newspaper El Observador [es] reports that environmental impact studies for Aratiri will be ready in 18 months. Until then, we can expect the conversation to continue on the streets and on social networks.